Monday is here again bringing the chance to practice flower arranging by joining in Cathy’s weekly challenge In A Vase On Monday. The goal is to fill a vase using materials gathered in one’s own garden. With a Monday vase in mind I have had my eye on a white phlox that began blooming last week. New to the garden this year, this one is called Phlox paniculata ‘White Flame’ and is a dwarf garden phlox. Last night I gathered two of the only three blooms on the plant to use today. For companions to the featured phlox I selected a large bundle of lavender and some echinacea. The day was busier than expected so I abandoned the idea of formally arranging the flowers and decided to eliminate the echinacea altogether. 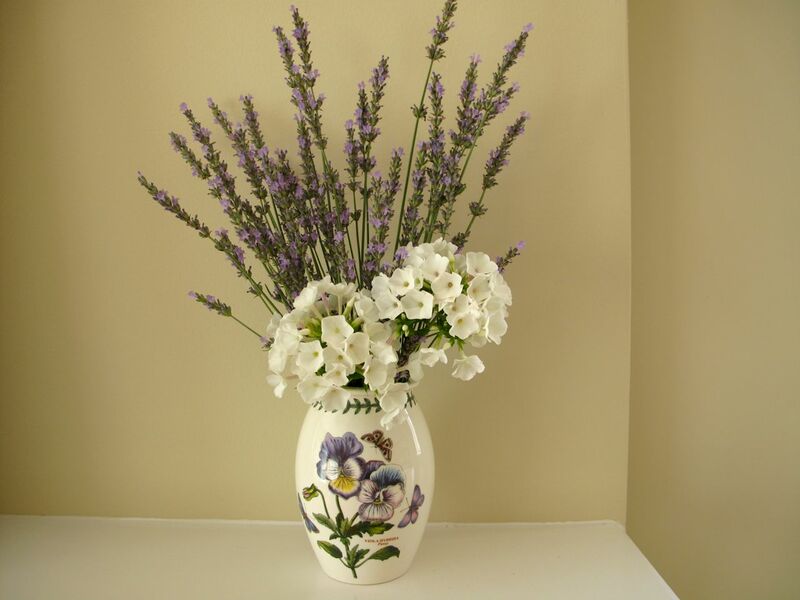 Using a Portmerion botanic vase that reflects the lavender and white coloring of today’s blossoms, I massed the phlox together in front and the lavender together in back for a simple display. Once I photographed the flowers I was not satisfied with the design. My use of space struck me as more flat and two-dimensional than I would like. So in the end I decided to add an echinacea or two to get something happening on another plane. It took more than two but I liked the result. Adding the echinacea made the arrangement more dynamic and definitely gave it a pop of color. It is always instructive to explore and experiment with these arrangements. If I were to start over I can think of several other ways I might try to assemble the flowers. But this is it for today. This entry was posted in garden and tagged echinacea purpurea, flower arranging, flower design, in a vase on monday, lavender, nature photography, Phlox paniculate 'White Flame' on June 23, 2014 by pbmgarden. I thought the combo of phlox & lavender was lovely & then the echinacea blew me away!!! Thanks Jayme. Glad you liked them. The real gift of a gardener is to provide a little assistance, a little help, in seeing the real beauty that was there all along…That is not a small gift. Your words are a gift. Thanks Charlie. Beautiful! – and wow the purple coneflowers are spectacular! Thank you. I’m glad I decided to use the coneflowers after all. Thanks–I have a hard time photographing my arrangements, but it’s fun to practice. It’s such a learning experience, isn’t it Susie? It would have been easy to have been satisfied enough to leave the phlox and lavender as they were, particularly if you had a busy day, but the echinacea really does change the dynamics altogether. You have such a good ‘eye’ as I don’t think it would have worked as well if the echinacea were all the same height and just mixed in with the others – you have cleverly varied the height and the angle. Thanks so much for adding to our learning experience by contributing to this meme! ps how tall does this phlox grow? Yes, definitely a learning experience Cathy. Doing the Monday vases is a good challenge. The height of Phlox paniculata ‘White Flame’ is 30-45 cm (12-18 inches). I overestimated how tall it would be and really should have planted it closer to the front of the border. 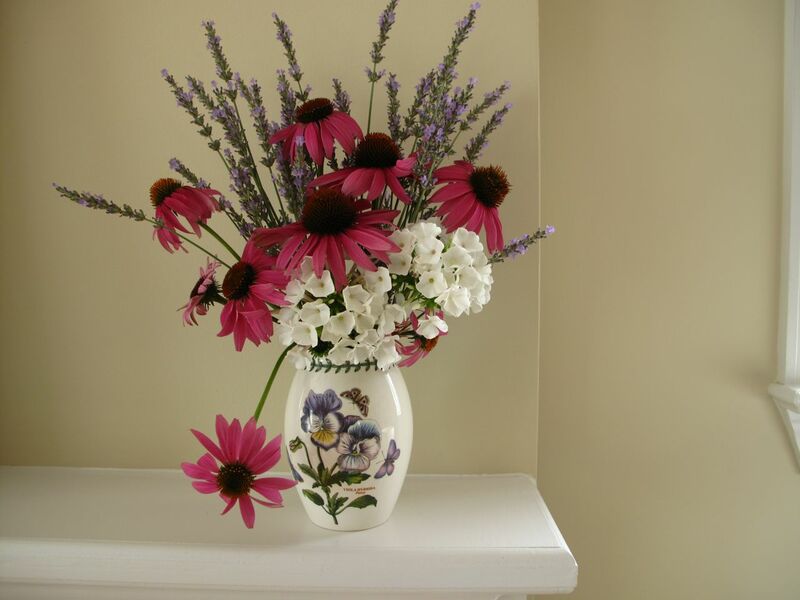 The Echinacea certainly add a punch but the vase was pretty in the first incarnation too. In fact, the vase is truly beautiful on its own. Your entire vase collection is impressive, Susie! Thanks for the encouragement Kris. I learned a lot from each arrangement. 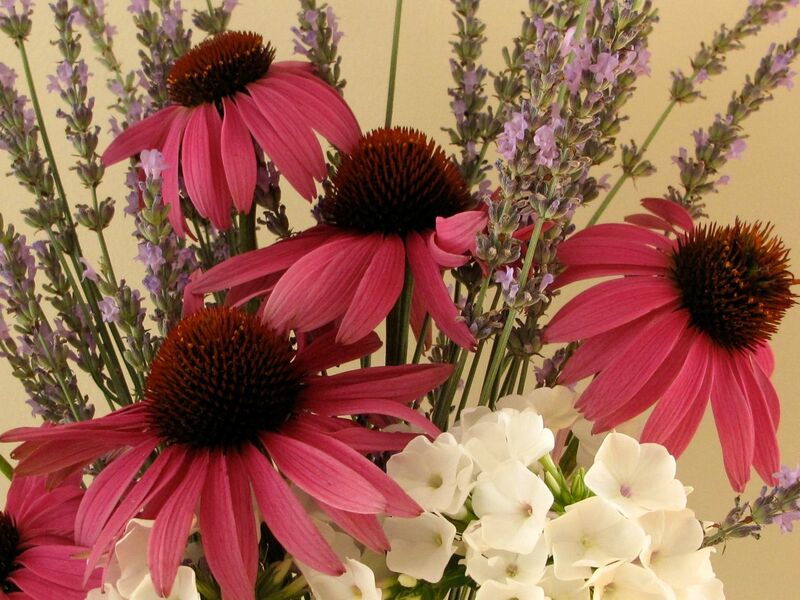 I love the addition of the echinacea Susie – it brings the brings the arrangement to life! Well done for making such an effort when you were already busy.We are all learning so much from each other and our commitment to a ‘Monday Vase’. You know, Susie, looking at your creations always gives me a lot of peace…it’s a bit like meditation. Calm and collected. That’s a delightful reaction Annette. Thank you. Oh I do like that final arrangement Susie – the echinacea provides the perfect finishing touch. Is the phlox highly scented? Thank you Anna. The phlox has a slight scent. How lovely and it is nice to see your pretty Portmeirion vase again. 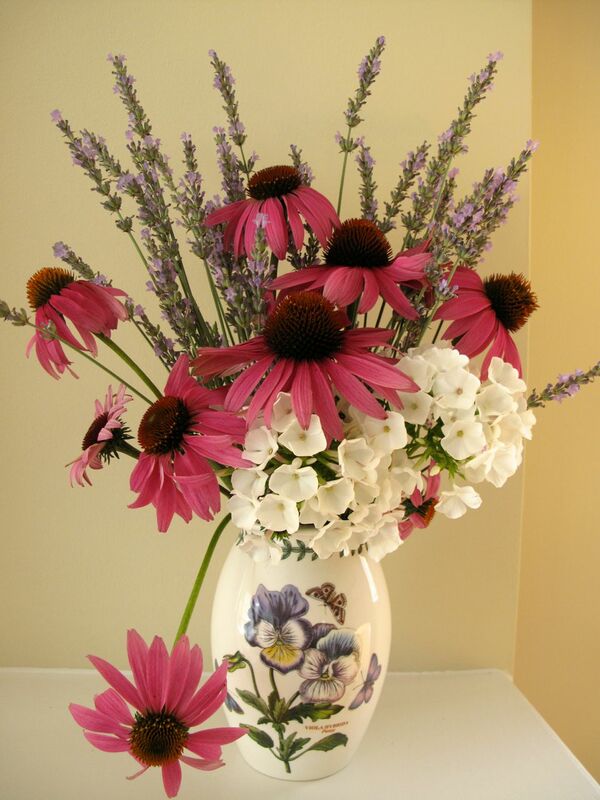 I love the lavender and phlox arrangement but the echinacea gives it an extra zing. You are good at this Susie. I appreciate your encouragement Chloris, especially after seeing all your lovely arrangements from the wedding. Really lovely. I had a tough time deciding which one I liked best. Voted for the fourth photo. 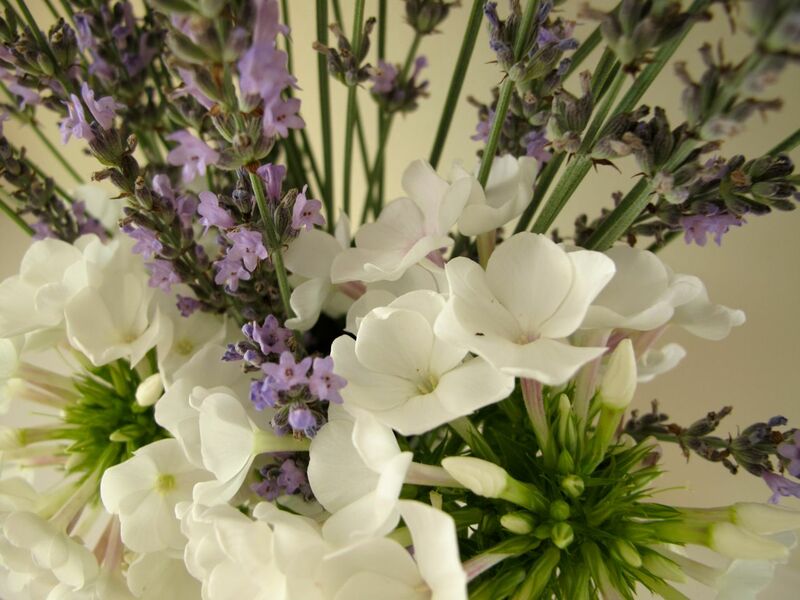 The combination of these three flowers must have given you a heavenly scent. The lavender is very strong and nicely fragrant, but not so much the echinacea or phlox. Someone else asked whether the phlox was heavily scented, so I checked. It doesn’t seem to me to have a particularly nice smell. I need to look for a different kind perhaps. I like both incarnations of the arrangement, the coneflower adds something new to the composition but the phlox and lavender are nice enough. Maybe another bunch of phlox and having the lavender spikes come up throughout would help give it a third dimension? I also like how the first arrangement echoes the shape and color of the pansy on the vase. Nice!